Australian marketing and media blog Mumbrella has appointed Robin Hicks as its new Editor. Hicks takes over from founder Tim Burrowes, who has moved to the new role of Editor-in-Chief of parent company Focal Attractions. 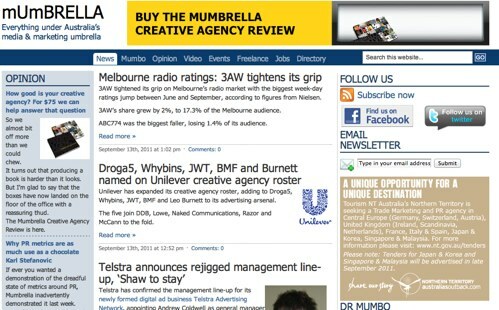 The company publishes screen industry blog Encore, as well as Mumbrella. Hicks joined Mumbrella as Deputy Editor in March 2011 after serving as the Editor of FutureGov from February 2009 to December 2010. Burrowes will be focusing on relaunching the Encore blog.